Rent Chilo's | Corporate Events | Wedding Locations, Event Spaces and Party Venues. Chilo's is a black tile, neon-lit bar and taco truck in Bed-Stuy, Brooklyn. 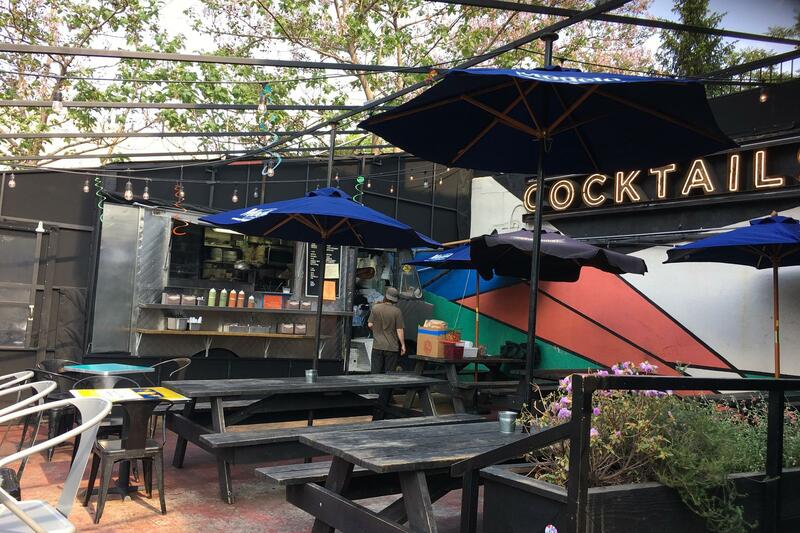 We feature delicious tacos from our own truck, permanently parked in the backyard area, as well as friendly staff, frozen cocktails and a full bar featuring a wide selection of agave spirits. Our staff and full bar are equipped to make a huge selection of cocktails, but we are known for our Frozen Cocktails, of which our Margarita (with optional flavor additions available) and Rum Painkiller are our most popular, with a third rotating Seasonal drink available in addition to our expansive Tequila and Mezcal selection. We have an assortment of US and Mexican beers in bottles, cans, and on draft. Our beer menu is customized seasonally and to pair with the food from our taco truck, and we offer Mezcal Flights for the uninitiated and experienced alike. Our permanent taco truck features delicious Tacos, Tostadas and Torta sandwiches. Our tacos are served on soft corn tortillas, and Tostadas on flat crispy corn shells. We offer a selection of meat options - Chicken, Smoked Beef Brisket, Carnitas, Cochinita Pibil, Duck, Pork Belly - all spiced, smoked, braised, or slow-roasted in house. We have hearty vegetarian, vegan and Pescatarian options as well - Fried fish, nopales, and mushroom tacos, as well as avocado or nopales tostadas for those looking for a filling alternative.